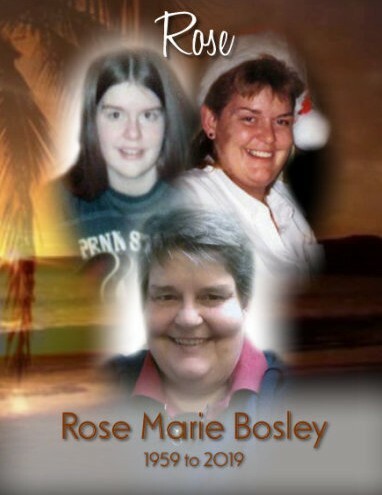 Obituary for Rose Marie Bosley | Kenworthy Funeral Home, Inc.
Rose Marie Bosley, 60, of Hanover, PA, entered God’s eternal care, Monday, March 18, 2019 at home with her loving family by her side. Rose was born in Gettysburg, PA, on February 21, 1959, and was the daughter of Kenneth and Winifred (Redding) Bosley of Hanover, PA.
Rose was a 1977 graduate of South Western High School, Hanover, PA. She worked as a computer programmer and a cabinet designer. Rose was a member of AA and NA. Rose enjoyed her beach trips and spending time with her friends. In addition to her parents, Rose is survived by her daughter, Tammy Freeman and her fiancée, Michael Wise of Hanover, PA; three grandchildren, Desiree Hull, Aaron Hull, and Alexis Freeman, all of Hanover, PA; one great-granddaughter, Arianna Hull; and a brother, Michael K. Bosley of Arlington, VA.
A memorial service to celebrate and remember Rose will be held 6 PM, Friday, March 22, 2019 at the Kenworthy Funeral Home, Inc., 269 Frederick Street, Hanover, PA with the Rev. E. Robert Burkhart officiating. A visitation and time to share memories with the family from 5-6 PM, Friday, March 22, 2019 at the funeral home. Burial will be private and at the convenience of the family. In lieu of flowers, donations may be made to the Kenworthy Funeral Home, Inc., 269 Frederick Street, Hanover, PA to help defray the funeral expenses.